The second edition of our introductory World War One air combat rules rules written by David Manley for use with miniatures from 1/72nd to 1/600th scale. AirWar: 1918 (2nd edition) is currently undergoing pre-production for release later this year. Try it for free! AirWar: 1917 is a free downloadable PDF available exclusively from Wargame Vault. A stripped down version of the AirWar: 1918 (2nd edition) rules, AirWar: 1917 allows you to fight out dogfights between Sopwith Camels and Fokker Dr.1s. 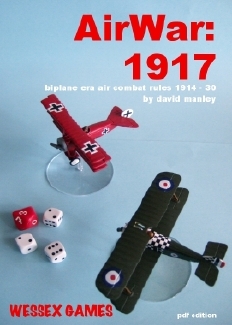 Includes: Stripped down core 2nd edition rules Stats for Sopwith Camel and Fokker Dr.1. Printable counters of the aircraft in case you dont have the particular models. Pages: 9 A4 including cover. To download the AirWar: 1917 go here.